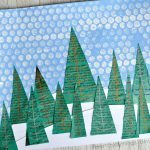 I’m pretty sure that after sharing our newspaper owls, snails and hot air balloon, that I’ve convinced you that you absolutely need to try out watercolors on newspaper! 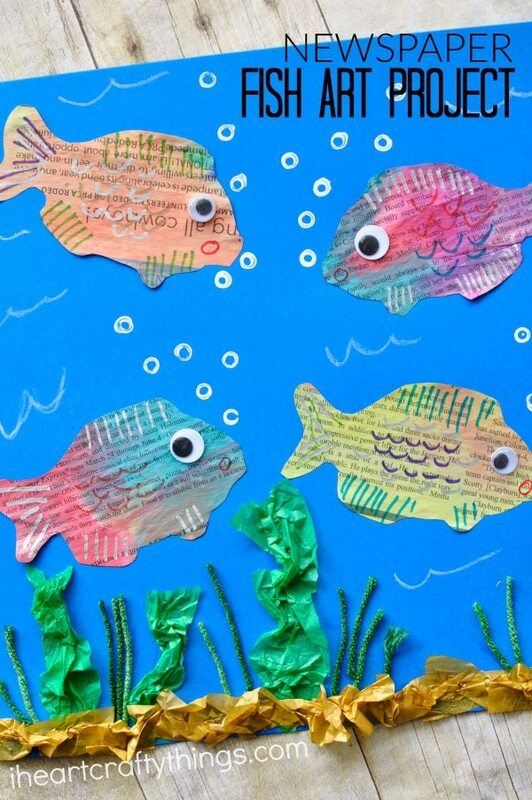 But just in case you weren’t already convinced we made this beautiful mixed media newspaper fish art project to help convert you into loving it. 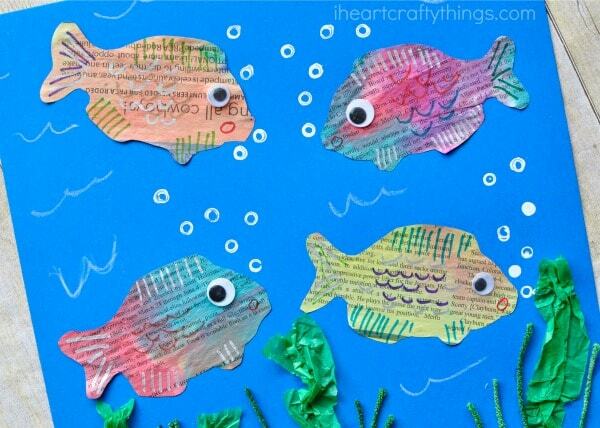 The text on the newspaper mixed with the bright colors of the watercolors makes for some totally awesome fish and the texture of the yarn and green tissue paper really brings this fish art project to life. 2. 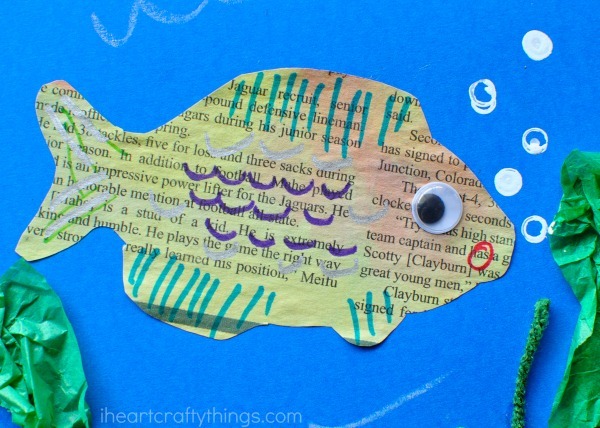 Glue your newspaper fish onto your blue cardstock paper. 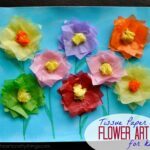 Then, use crinkled green and gold tissue paper and green yarn to create ocean plants and sand at the bottom of your paper. 3. After finishing your ocean floor, use your Sharpie markers to draw details on your fish like fins, scales and a mouth. You can also glue a googly eye onto your fish at this point. 4. 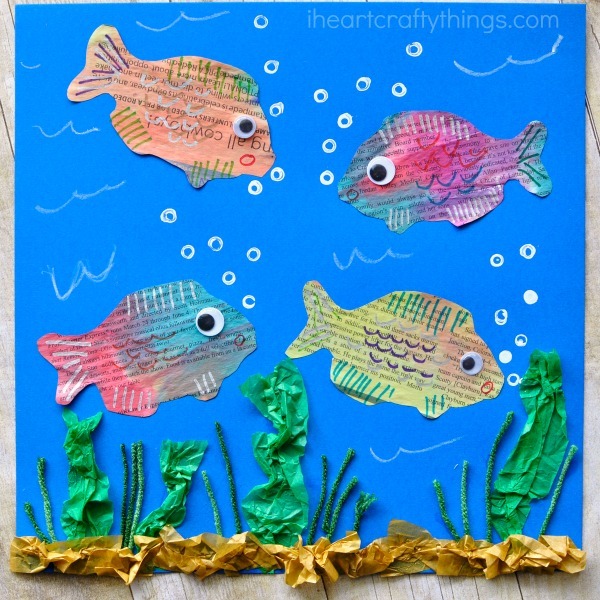 For the fish bubbles, dip the end of a paper straw into some white paint and then stamp it onto your paper to make a little white circle. Sometimes a little bubble forms over the end of the straw when you dip it in your white paint, so make sure to look and blow out the bubble before printing it on your paper, or you’ll end up with a solid white circle. 5. 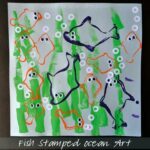 Finish your beautiful mixed media newspaper fish art project by making water waves around your paper with a white crayon. Aren’t you convinced now about how wonderful watercolor painted newspaper is?! Our fish art projects turned out so exquisite! They have taken center stage on display on our art wall in our family room and every time I look at them I can’t help but smile.